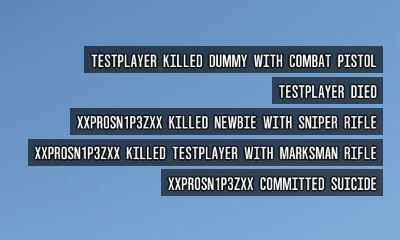 Simple kill feed script that displays recent deaths on the server. Even though this is a kill feed script, you can send other messages to players by passing a string (your message) to pushToKillFeed event. The kill feed is located below the ammo counter HUD element. Not all death reasons are detected but weaponData.json covers most cases. Default kill feed font might not support all characters.